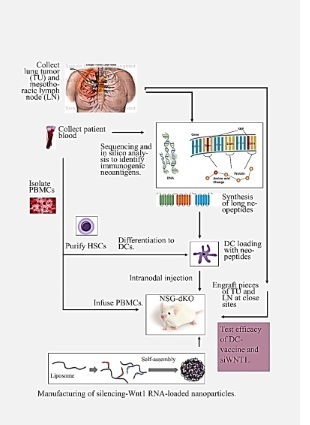 Targeting human Wnt1 via siRNA nanoparticles to boost dendritic cell vaccination against lung cancer neoantigens. Tumors induce cellular and molecular microenvironments that impede T cell priming by DCs. This indicates that most cancer patients are unlike to respond to vaccination monotherapy approaches and suggests that combination strategies with agents that specifically target the tumor microenvironment should be adopted. We recently set up in vivo mouse models, coupled with analysis of primary human tumors, which show that Wnt-1 expressed by lung cancer cells acts paracrine on intratumoral DCs to promote T cell tolerance against cancer-associated antigens. Our current working hypothesis is that integrating Wnt1-targeting to DC-based vaccination against patient-specific mutation-derived antigens can induce effective antitumor immunity. We are integrating a collection of omics technologies and bioinformatics algorithms to identify mutation-containing immunogenic peptides, along with novel culture technologies for large-scale human DCs differentiation from non-mobilized blood hematopoietic stem cells, to develop neoantigen-presenting DCs suitable for vaccination. To test whether siWNt1 acts in synergy with DC vaccination we are creating a novel in vivo humanized mouse model that allows long-term development of primary and recall T cell responses to cancer antigens in an autologous setting. Understanding the role of lung cancer-associated fibroblasts and endothelial cells as atypical cancer antigen-presenting cells. More and more cell types are proposed to express MHC class II molecules. MHC class II expression alone is not sufficient for full antigen-presenting cell (APC) function. Most non-professional (atypical) APCs cannot provide additional stimulatory signals, thus they modulate and usually suppress T cell responses initiated by professional APCs. Cancer-associated fibroblasts (CAFs) and tumor-associated endothelial cells (TECs) crosstalk with immune cells and cancer cells through incompletely understood paracrine signaling. Healthy tissue endothelial cells and myofibroblasts may express MHCII, co-inhibitory and co-stimulatory molecules. Whether CAFs and TECs capture cancer-associated antigens and present MHCII-peptide complexes to cancer antigen-experienced T cells to inhibit adaptive immune resistance is unknown. We have found that murine TECs and CAFs constitute the majority of non-hematopoietic MHCII-expressing cells. We are developing novel mouse strains with targeted deletion of MHCII in CAFs and TECs to elucidate their role in cancer-antigen presentation and T cell tolerance. We are using sequencing and protein-based single cell approaches to identify subsets of human CAFs and TECs with phenotypic and functional profiles of tolerogenic antigen-presenting cells in primary human lung adenocarcinomas. To test the immunotherapeutic value of inhibiting CAF and TEC-dependent antigen presentation we apply targeted RNAi technologies.